Most of people working in the field of biological or scientific research should greet the open hardware applications we are witnessing in this age of Garage Science. From the Phduino to the DIY Oscilloscopes, through STM (Scanning-Tunneling Electron Microscope), Arduino is getting used to prototype tools that used to be more expensive and possibly unavailable some years ago. 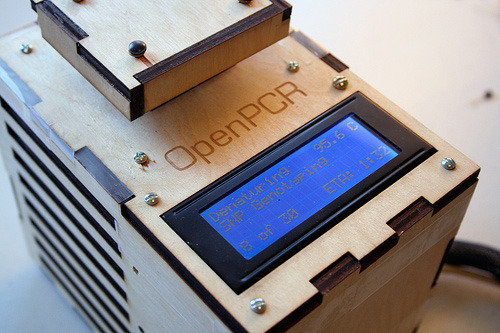 DNA Sequencing – PCR is used to generate enough DNA for the sequencing run. You can have a look at some of your own genome! DNA Barcoding – Determining the species based on DNA. Can be used to identify plants, screen for agricultural pests, investigate airplane bird strikes, and check that sushi is legit. What about testing your food to see if they contain GMOs (Genetically Modified Organisms)? The Polymerase Chain Reaction, or PCR, is a method of replicating DNA. It is capable of taking a small amount of DNA, or even a single molecule, and amplifying (copying) a specific region exponentially, such that once the reaction is finished, there may exist up to 230 copies of each starting molecule (do the math — that’s more than a billion!). This is important because DNA of interest often exists in quantities too small to detect, or may be mixed in with other DNA. For example, an accurate test for HIV must be able to detect a single virus particle in 50,000 cells. PCR is able to do this by targeting a small region of DNA that is specific to the HIV virus. If the virus exists in a sample, amplification will occur which can be easily detected. If no virus is present, no amplification will occur. The specific region of targeted DNA is determined by how the reaction is setup, based on the specific “PCR primers” added to the reaction mixture. Virtually any sequence of DNA can be targeted. if you still have some questions and / or want to know more about PCR have a look at this wonderful & explanatory graphics.